If you find pleasure in examining tangible objects that tell stories over a century old, you will enjoy a short two-hour day excursion to the Indian & Sea Museum in Orange Beach. Learn about the town's history and how it evolved from an area inhabited by Native Americans to a fishing village to the resort town that it is today. You'll imagine what life was like in a small-town school house 100 years ago, and learn about life for families and fishermen before electricity, motor boats, and air conditioning. You'll also be able to get a glimpse of life thousands of years before European settlers arrived when Indians hunted and fished along the beaches and in the wooded areas of Baldwin County. 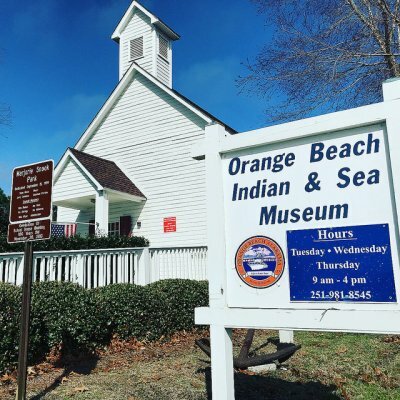 When you approach the Indian & Sea Museum located on John M. Snook Avenue (not far from our Orange Beach rentals or Gulf Shores condos), you'll notice that it is an old schoolhouse with a small white bell tower still intact. The bell itself, however, was destroyed by a hurricane in the late 1920s. The schoolhouse was built in 1910, and it still contains some original artifacts and furnishings that are over 100 years old. You'll see the original small wooden school desks and picture the simple but hard life that once existed where children used wood burning stoves for warmth and played with a goat in the school yard. 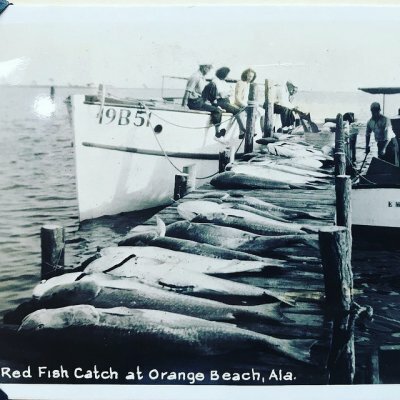 You'll learn about how two families in Orange Beach history, one family of shrimpers and the other fishermen, and how they cultivated the town's fishing industry. On display in this Orange Beach museum are various types of fishing and boating equipment as well as old farming tools. Among the Native American artifacts you'll find arrowheads and spearheads, portraits of Creek Indian chiefs, stone knives, Indian beads, feathers and pottery. Baldwin County's Native American population can be traced back about 10,000 years to Pre-Mississippian tribes called mound builders. Some mounds can still be spotted around Baldwin County. These Native American tribes used mounds as burial and ceremonial sites. The Indian tribe that inhabited the area at the time of the arrival of European settlers from Britain, France and Spain were called the Creek Indians, also known as the Muscogee Indians. The Creek Indians were not nomadic as so many others were. They built thatched huts and practiced agriculture. They raised livestock such as cows and pigs and established communities. When a community would get too large to sustain, they would divide the community into two and establish a new one not too far away from the original. The most important social unit of a town was a clan. While town leaders were chiefs, clan authorities were elderly women. Clan lineage was matriarchal. To learn more, stop by the Indian & Sea Museum, near our Orange Beach condos and Gulf Shores rentals. Admission is free, and it is open Tuesdays and Thursdays from 9 am to 4 pm. If you have a group of five or more, you may call and schedule a reservation for a tour outside of opening hours. See contact information below.